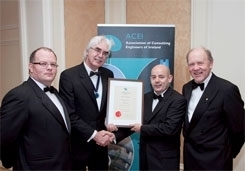 Varming Consulting Engineers won the prestigious ACEI Annual Design Excellence Award for 2011 for the Charlestown Mixed Development Project. Pictured receiving the Award, at the Annual ACEI Dinner held in the Four Seasons Hotel Dublin, are James Kavanagh Varming Joint CEO, Eamon Timoney ACEI President, Joe Byrne Varming Project Director and John Purcell Varming Chairman. In this article, Joe Byrne outlines the main sustainable aspects of the design undertaken, and some of the solutions adopted to address the challenges encountered. Varming Consulting Engineers were engaged by Bovale Developments as the M&E Building Services Designers for the project. Phase 1 of the development was handed in 2007. The Charlestown site was purchased and developed by leading Irish developers, Bovale Developments, who have been responsible for major commercial & residential projects, both in Ireland and the United Kingdom. 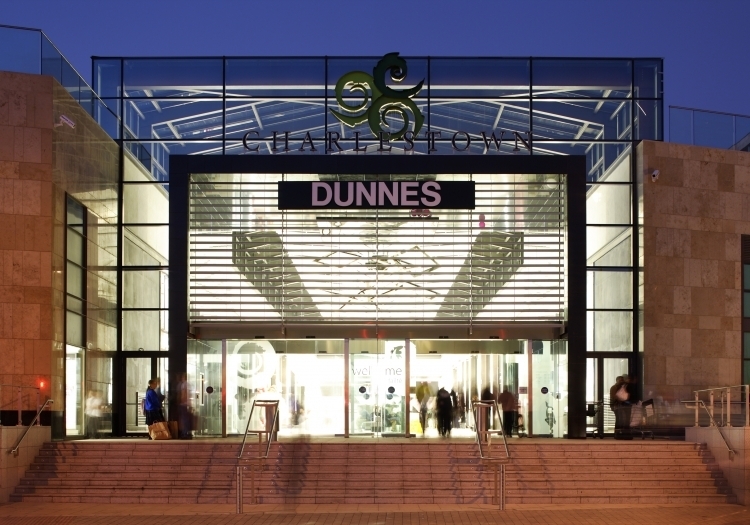 Charlestown Phase One is a fully occupied major, mixed development construction in North Dublin, consisting of Shopping Centre, Retail, Offices, Crèche and Apartments located adjacent to M50 / N2 junction. Phase One was opened in 2007 and consists of a 50,000 sq.m of development spread over 285 apartments, situated on a podium deck over a Retail Shopping Centre. The scope of the initial design activity included the development of the site infrastructure for all future Phases (2, 3 and 4), which will consist of over 100,000 sq.m of retail, offices and residential development. The design of this highly complex project was conceived and approved on a strict design, installation and cost platform which proved very effective in its implementation. The sustainable design approach to the Charlestown Development was to utilize state of the art technology to provide an energy efficient and economical form of living which would maximise the use of green products and reduce greenhouse gas emissions. This approach was embraced by the whole Design Team. The Apartment Blocks were constructed to best practice standards in order to minimise heat losses and to reduce energy demand for heating. A high performance façade was introduced, through the use of a glazing system with a high efficient thermal transmission factor and reflectance values, thereby allowing for increased glass area and giving improved access for occupiers with daylight and views. Extensive dynamic thermal simulations undertaken in relation to the Mall Area demonstrated that, with the inclusion of draft lobbies and strategically placed air curtains, the need for heating these spaces could be eliminated. Other simulations proved that the desired ambient conditions within the mall could be achieved by natural ventilation. All of the apartments were designed to stringent air tightness standards and pressure tested to confirm the elimination of unnecessary infiltrating draughts and leaks. Energy efficient strategies and cost saving measures were introduced for the electrical consumption within the apartments, and included the use of low energy down lighting and Grade “A” white goods.